The Ari of southwestern Ethiopia are known for being an artistic people. 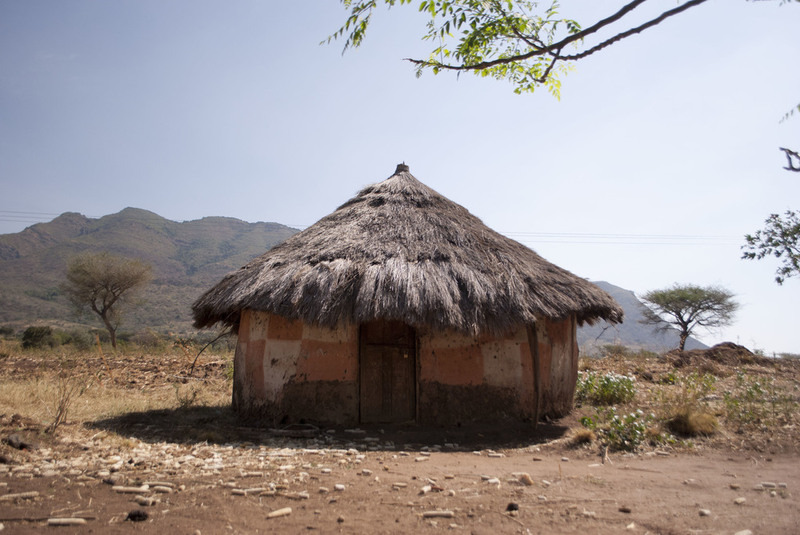 Throughout the Omo River Valley, Ari women sell local pottery, make enset skirts from banana leaves, wear brightly beaded jewelry, and decorate the walls of their houses with soil-based paints. These decorations are known locally as “bartsi;” in the Ari language, bartsi means to make beautiful. The history of Ari wall decoration is not well known. 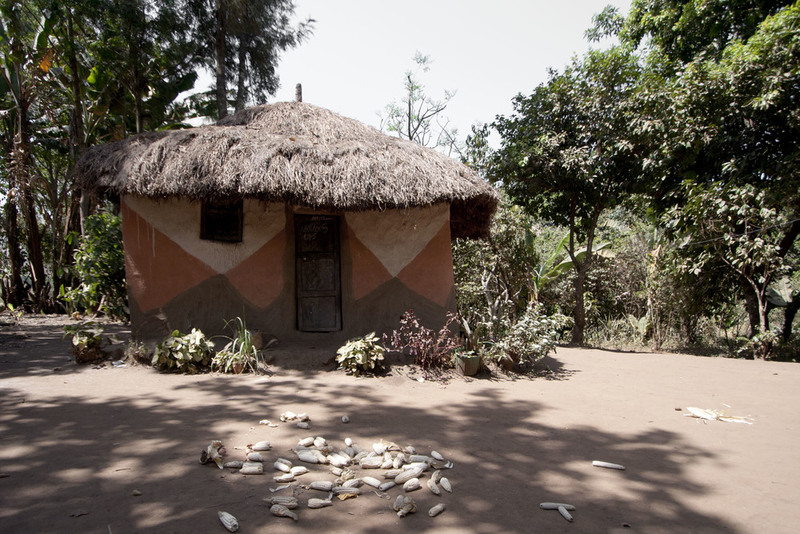 Many Ari women say that bartsi is a tradition that dates back to their ancestors with roots in the desire to beautify the home and decorate for traditional ceremonies. Interestingly, bartsi is not seen as being on par with pottery, dancing, singing or the Ari language. Women do not see the paintings as being important or being part of their culture; they simply make paintings for beauty. In many ways, the paintings are a series of conventions without cultural or historical precedent. In order for a painting to be considered bartsi, it must contain three different colors or three types of soil. 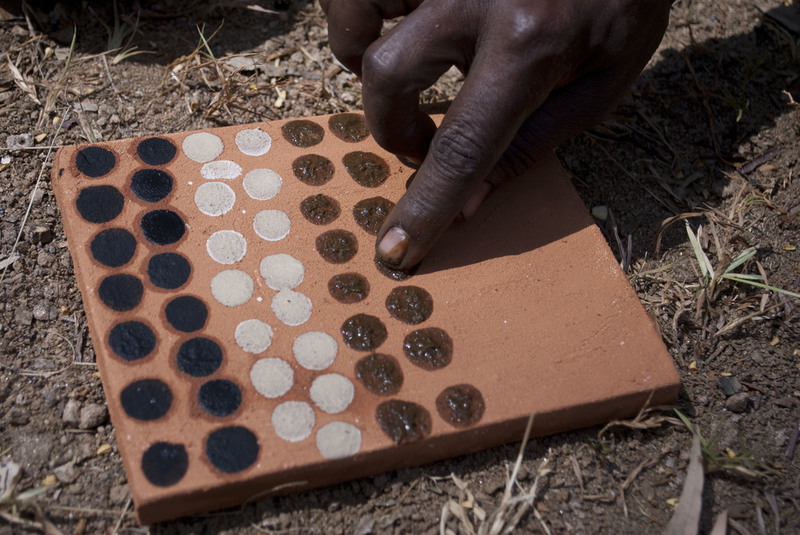 Paintings are created with black soil (chaime) mixed with powder from crushed 9V batteries, white soil (tsami), red soil (zayme) and occasionally a rare yellow colored soil. Because these four soils are only found in the southern portion of Ari territory, paintings only appear in this region. Collecting the soils is the most challenging part of making both paintings and pottery. 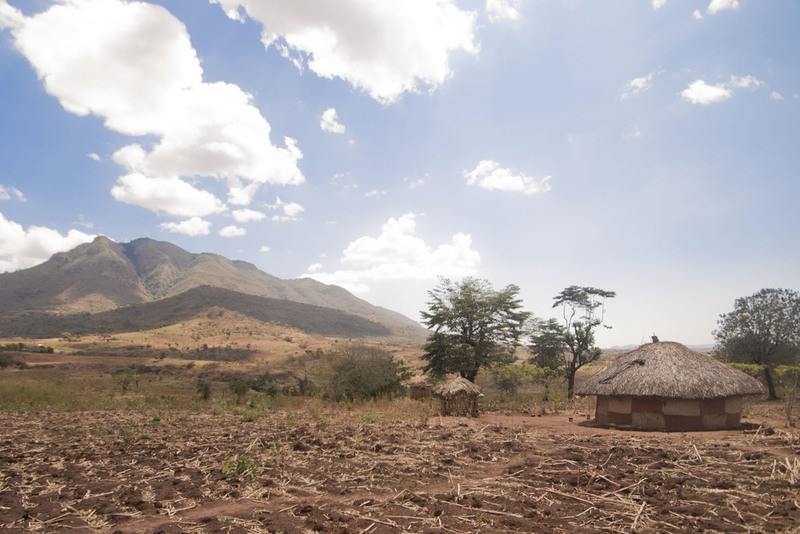 Women walk for up to 10km to collect loam from deep crevices in the earth. Once the soil has been collected, women mix the it with water and apply the mixture to dry walls using their fingers, corn husks, sticks or pieces of plant stalk. Visually, the result takes two forms. The more traditional bartsi style uses only dots to create both abstract shapes and representational forms. The second style, which is inspired by the city, is a mixture of geometric shapes, primarily triangles and stripes. Both the dot painting and the geometric painting are considered equally “Ari,” although the dot painting is viewed as being more impressive because it is much more difficult to execute. 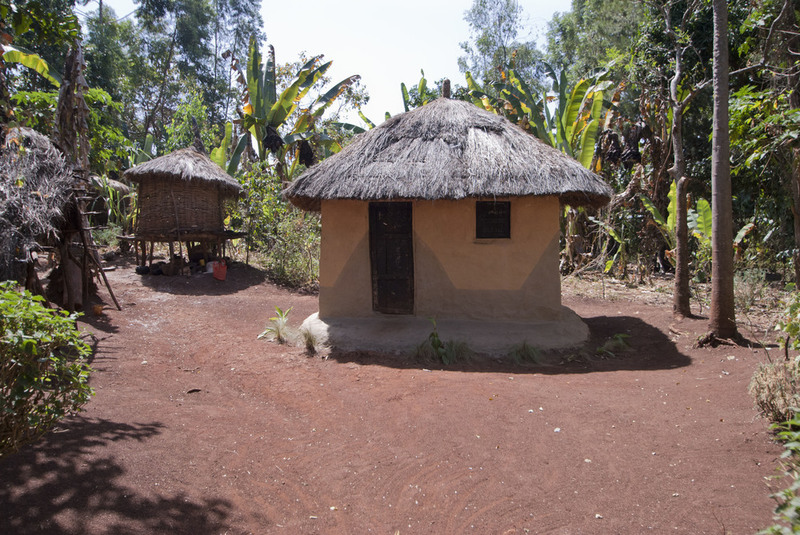 There is little stylistic consistency among Ari houses, although within villages and their subsections, there are often similar designs. This occurs because many women copy from each others’ walls. Regardless of which style women choose, most paint the front street-facing or walking path-facing side of their houses so that others can see their designs. The majority of Ari women paint for holidays, although in a ritualistic rather than a religious sense. Until about twenty years ago, most Ari were strictly animist. However, in the years since, the majority of the Ari have fiercely adopted Protestantism. As such, the paintings that used to be made for traditional ceremonies are now made for Protestant holidays. Today, the decorations are made anywhere from two to seven times each year, before traditional ceremonies like weddings, funerals and anniversaries, Ethiopian holidays like New Years and religious holidays Christmas, Meskel, and Epiphany. Holidays of all kinds serve as the impetus for Ari women to beautify and clean their homes by making bartsi. The arrival of Christianity has slightly altered the iconography of bartsi. Prior to the arrival of the missionaries, women used to paint mostly representational forms, like snakes and crocodiles, using the dot style. However, the missionaries discouraged this type of painting because they saw it as being akin to idolatry. Instead, they encouraged the women to transition to painting more geometric abstract shapes, and to copy bible verses onto the walls. Importantly, bartsi has been able to adapt and flourish in the shift from animism to Christianity. If anything, Christianity has only created more opportunities for Ari women to paint. 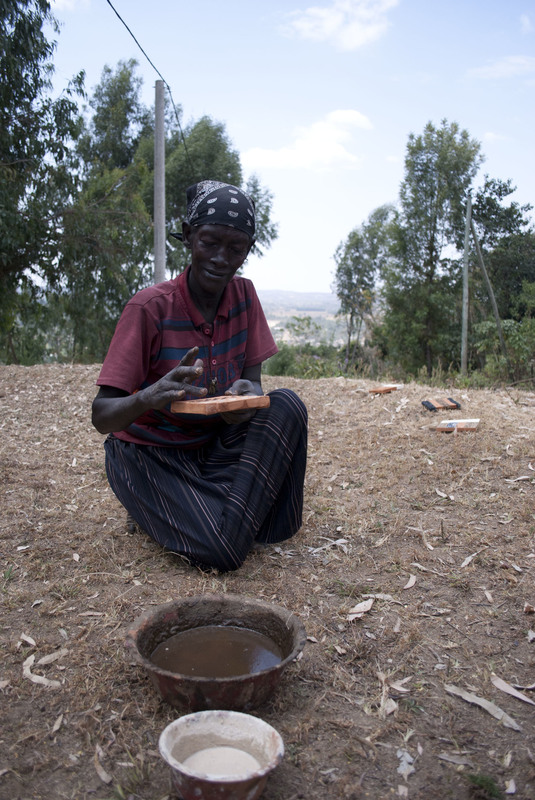 Few Ari women have well articulated reasons for making bartsi; many say they paint because they saw their neighbor doing it, because it is beautiful, or because it is part of a woman’s responsibility to clean the home. 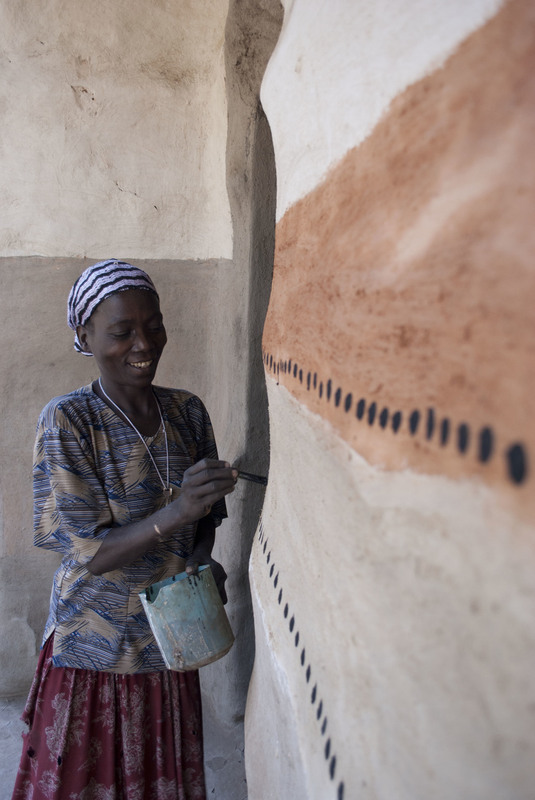 Unlike other forms of wall painting in Africa, bartsi is not linked to elevating social status. Women who belong to the Gita Mana and Oto Mana, the lower potter and blacksmith classes, are more likely to make paintings then members of the Kansa, or higher farming class. The Mana are more likely to make paintings because they are more closely tied to the soil through pottery. Most women make bartsi for their own satisfaction and to impress local visitors who come for the Christian holidays. Sometimes, women may paint for the satisfaction of their husbands and to impress other people within their communities, although these motivations are often secondary. Women who paint to impress their husbands (or future husband) do so in order to distinguish themselves as hard workers. While making a painting does not show that a woman is hardworking on its own, it does help to build such a reputation. Similarly, while women do not paint to gain respect in their communities, when they do make designs, they often receive praise and admiration from their neighbors. Receiving praise from men, the community and from the occasional tourist encourages Ari women to continue making bartsi. In 1994, in an effort to showcase bartsi, an anthropologist working at the South Omo Research Center (SORC) asked a few women who lived in Girsh, a small Kansa village behind the museum, to make bartsi paintings on canvas. Once the canvases went up on the walls of the museum, tourists were captivated by the paintings and the way their style was so visually continuous with the work of Australian aboriginals. Many wanted to take the paintings home. 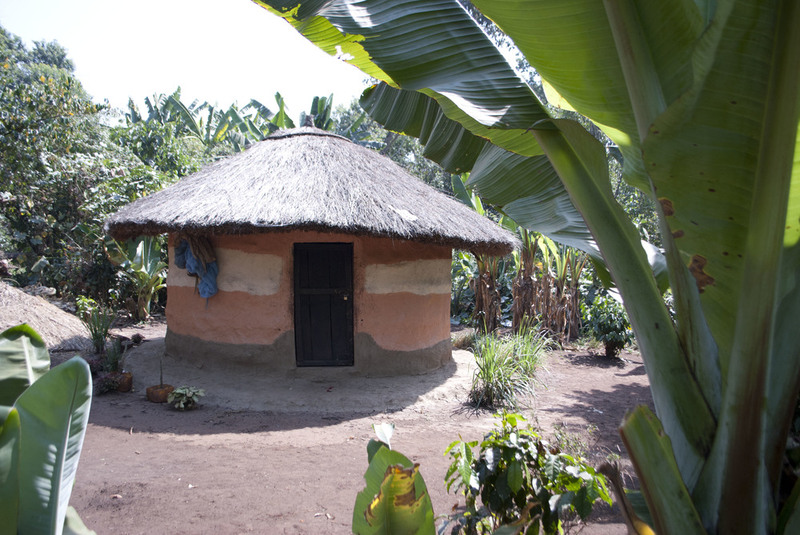 Interestingly, while the women involved in the project say that making the paintings on canvas and receiving a salary has reinforced their desire to paint, the influx of income has allowed them to move out of their grass houses and into concrete “modern houses.” The women will not make barsti on the modern houses because they believe bartsi only belongs on mud walls. Because bartsi must be made of soil, making the designs with modern paints is not an option. The “Bartsi Project” is strictly dedicated to canvas painting, not encouraging tourism in Girsh. Tour guides do occasionally bring visitors to Mana communities like Yetnabersh and Kure to learn about local pottery and njera making as “filler” in a larger tour program within South Omo. During these visits, bartsi is never the focus; tourists rarely ask about the paintings even when they take photographs. The number of women making bartsi today is dramatically decreasing. The rising adult generation is the first to have been exposed to formal education, organized religion and increasing urbanization. While the SORC project has educated the women of one specific community about bartsi and the fact that the art form is a part of local culture, this concept has failed to spread throughout the larger Ari community. 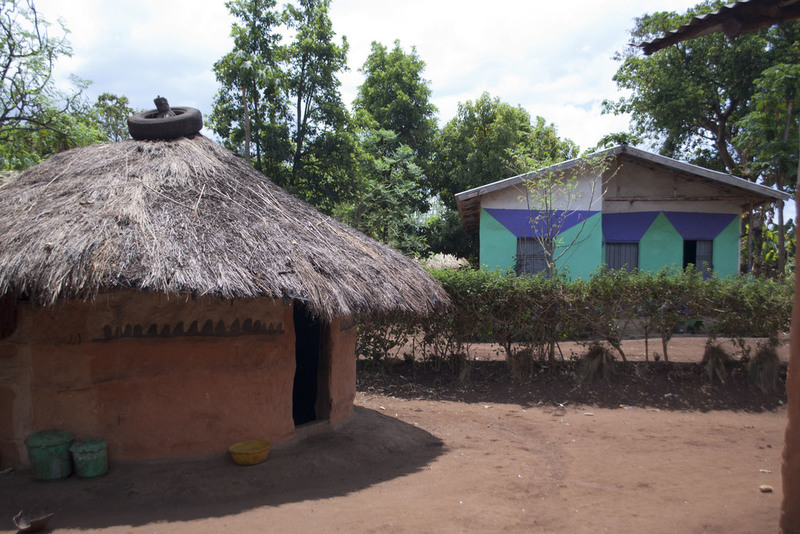 As rural Ethiopia is becoming increasingly connected to the outside world, the infiltration of modern paint and concrete houses has shifted the already narrow attention away from bartsi. Additionally, local soils deposits, which have been mined for years are disappearing and new deposits are further away or on private land. The international funding for the Bartsi Project recently ran out and with little to gain financially by making the paintings, in the quickly developing capitalist economy, the Ari are quickly leaving this aspect of their culture behind. Without strong cultural roots it will be surprising if the paintings continue to be made in the future. © ALLISON GREENWALD 2015. ALL RIGHTS RESERVED.